Walter ("Wally") Goldfrank. Photo by Melissa De Witte. 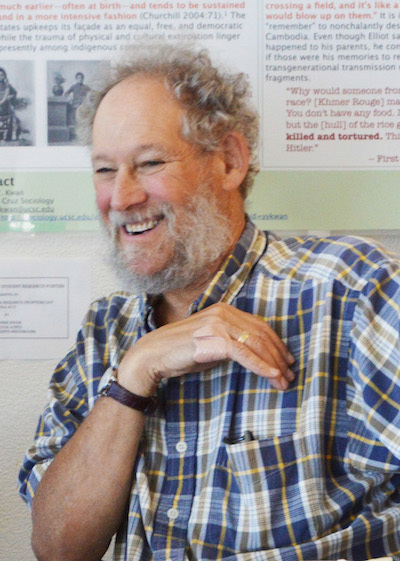 Sociology is very sad to announce the passing of Walter ("Wally") Goldfrank Professor Emeritus at the University of California, Santa Cruz. Professor Goldfrank graduated from Harvard University, and earned a certificate in sociology from the University of Madrid and a Ph.D. from Columbia University. During graduate school he worked part time at the NAACP Legal Defense and Educational Fund and later participated in the civil rights and antiwar movements. Wally joined the UCSC Sociology faculty in 1968. He was a founding fellow of Merrill College, and also helped found the Latin American and Latino Studies Department. He aided in LALS's recent creation of a Ph.D. program--the first of its kind in the nation. He was instrumental in shaping the Sociology Department's graduate program, serving significant terms as both graduate director and department chair. He also served as the provost of Rachel Carson College (formerly College Eight) from 1988 to 1996. Along with birding and travel, teaching was Wally's lifelong passion and throughout his career hundreds of students passed through his courses on world society; sociological theory; development and underdevelopment; revolution; and the sociology of sports. He also mentored many doctoral students over the years, signing off on his last dissertation just a few weeks before his death. Wally's commitment to justice and peace that comprised his life's work has had a lasting impact. As recently as June of this year, The Global Studies Association honored him at its 2017 conference at UC Berkeley. During a panel discussion there, four participants revisited research on fascism that Wally published in the 1970s. For more information about Professor Goldfrank and his extraordinary legacy, please also see his obituary in the Santa Cruz Sentinel. Donations in his memory can be made to the American Civil Liberties Union or to the Land Trust of Santa Cruz County.